Human remains found near Mercier bridge (thanks Anon) – WHO KILLED THERESA? Kahnawake Peacekeepers are investigating human remains discovered Monday afternoon near the Mercier Bridge. A construction worker found bones and a skull on the south shore, between routes 138 and 132. The remains were hidden underneath saplings and branches, leading police to declare the area a crime scene. 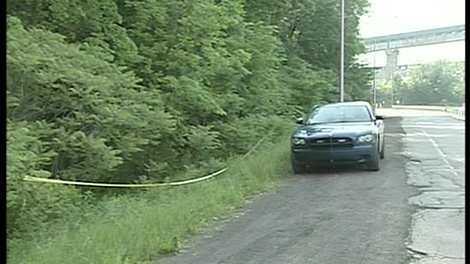 A forensics investigator is examining the remains, and trying to determine whether they belong to a man or a woman, and the approximate age of the person. Police hope that preliminary results will be available as of Thursday. They are saying that the remains might be those of Tiffany Morrison missing since June 2006.